Jennifer Pike first gained international recognition in 2002, when, aged 12, she became the youngest-ever winner of the BBC Young Musician of the Year and the youngest major prizewinner in the Menuhin International Violin Competition. Aged 15 she made acclaimed debuts at the BBC Proms and Wigmore Hall, and her many subsequent Proms appearances include being a “featured artist” in 2009. She was invited to become a BBC New Generation Artist (2008-10), won the inaugural International London Music Masters Award and became the only classical artist ever to win the South Bank Show/Times Breakthrough Award. Performing extensively as soloist with major orchestras worldwide, highlights include concertos with the all the BBC orchestras, London Philharmonic, Brussels Philharmonic, City of Birmingham Symphony, Strasbourg Philharmonic, Oslo Philharmonic, Royal Liverpool Philharmonic, Philharmonia, Royal Scottish National Orchestra, Hallé, Rheinische Philharmonie, Tampere Philharmonic, Malmö Symphony, Royal Stockholm Philharmonic, Prague Symphony, Auckland Philharmonia, Singapore Symphony and Nagoya Philharmonic orchestras. She has appeared as a guest director with the BBC Philharmonic and Manchester Camerata. She made her Carnegie Hall debut playing Vaughan Williams’ The Lark Ascending with the Chamber Orchestra of New York (also recorded for Naxos). Eminent conductors with whom she has worked include Jirí Belohlávek, Martyn Brabbins, Sir Mark Elder, James Gaffigan, Richard Hickox, Christopher Hogwood, Andris Nelsons, Sir Roger Norrington, Jukka Pekka Saraste, Leif Segerstam, Tugan Sokhiev and John Storgårds. As a recitalist and chamber musician, Jennifer Pike has collaborated throughout Europe with artists including Anne-Sophie Mutter, Nikolaj Znaider, Adrian Brendel, Nicolas Altstaedt, Maxim Rysanov, Ben Johnson, Igor Levit, Martin Roscoe, Tom Poster and Mahan Esfahani. In 2016 her series of recitals at LSO St Luke’s were broadcast on BBC Radio 3. She appears regularly at the Wigmore Hall and in 2017 will curate and perform three recitals in one-day celebrating Polish music, including specially commissioned work. An enthusiastic promoter of new music, she has had many works written for her, including Haflidi Hallgrimsson’s Violin Concerto, which she premièred with the Scottish Chamber Orchestra and Iceland Symphony Orchestra, Charlotte Bray’s Scenes from Wonderland with the London Philharmonic Orchestra at the Royal Festival Hall and Andrew Schultz’s Violin Concerto and Sonatina for solo violin. Her prolific and widely-acclaimed discography on Chandos, Sony and ABC Classics includes the Sibelius Violin Concerto with the Bergen Philharmonic and Sir Andrew Davis, Miklós Rózsa Violin Concerto with the BBC Philharmonic and Rumon Gamba, Bach with Sinfonietta Cracovia and Schultz with the Tasmanian Symphony Orchestra. 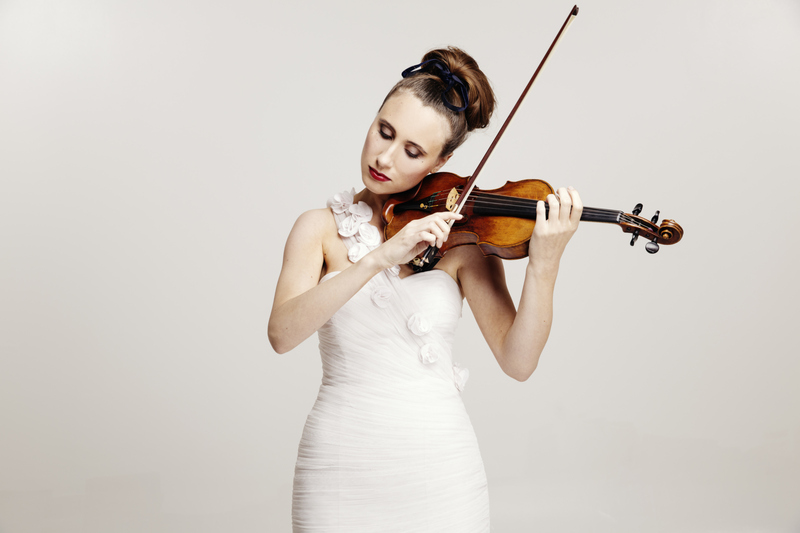 She recently recorded the Mendelssohn Violin Concerto with the City of Birmingham Symphony and Edward Gardner for Chandos, which was acclaimed in the Observer for her “innate musicality and mercurial technique” and as “breathtakingly beautiful” by the Sunday Herald. Future plans include concerts with the Royal Philharmonic Orchestra, BBC Philharmonic Orchestra, Rheinische Philharmonie, Tokyo Symphony Orchestra and the Dresden Philharmonic. She was recently invited to become an ambassador for the Prince’s Trust and Foundation for Children and the Arts, together with being patron of the Lord Mayor’s City Music Foundation.